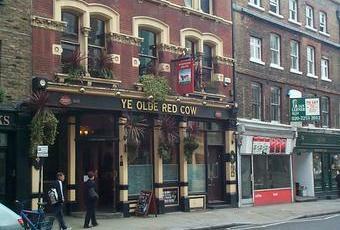 This is a great pub, with good choice of beer – including a stout (Titanic) on hand pull. But it is made by the staff, who are the most professional and friendly I have ever found in a London pub on first visit – in the last 10 years at least. It is rare these days to find staff who can a) pull a good pint and b) remember what you were drinking. But one of them – Daniel from Cuba – lent me a bike lock (stupidly forgotten) totally unsolicited, so I could drink inside, instead of outside on a cold November night. Excellent quality and range of beer, though some not cheap. Found the service a bit clinical though. Agree with Chelsea On Tour it's also very small so probably best avoided on Thursday/Friday nights. As oldtimer1955 said back in 2010, this pub is close to the Museum of London and open on Saturday afternoon - which is a good job because we were in desperate need of some liquid refreshment yesterday after several (interesting) hours in the museum. 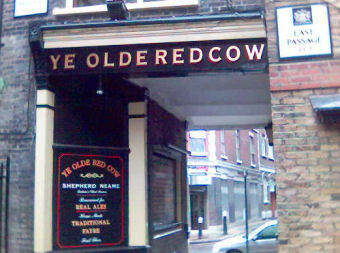 Now just known as the Old Red Cow, this pub's handpulls were Brockley's Red Ale and Wild Beer's Bibble with a further 11 "craft" beers costing up to £8.20 a pint. As such beers are not found in the provincial pubs in my part of the world, I thought it was time to move out of my real ale comfort zone so I went for a half of Siren Craft Brew's Smoke Signals at £2.90 - a "dry-hopped smoked sour Wheat Ale". I didn't really get any smokiness but I did enjoy the beer (as well as the real Orchard Pig Maverick Chilli and Ginger Cider) and the bar staff were very friendly and helpful too so a big thumbs-up from me. The beer was great and nothing was too much trouble and when we eventually moved to our table upstairs it was table service. Great beer, great pub and great bar staff. Give it another go and actually managed to get a pint this time. Ale was okay and the place is reasonable though populated by the pretentious at times. Some may carp at the prices but it is a Central London pub charging Central London prices. You can always nip round the corner to the Sam Smiths pub for cheaper.